I’d completely forgotten I’d written this interview until it popped up on Twitter today. 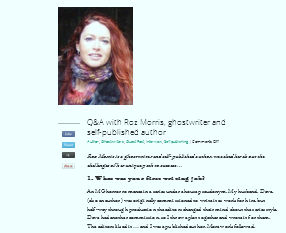 Whitefox publishing services wanted to quiz me about ghostwriting, my first writing gig and any tips I’d give to writers who were thinking of self-publishing. If you’ve known me for a while the answers will be old hat, but if you’re one of the recent subscribers (thank you!) and are still curious, here it is. If you’re wondering about your publishing options, you’ll find some useful tips here. And if you want advice on weighing up publishing services companies, these posts should help you make sensible decisions. And thank you, Whitefox, for inviting me to your blog.